MONTREAL, QUEBEC--(Marketwire - Oct. 30, 2012) - Matamec Explorations Inc. ("Matamec" or the "Company") (TSX VENTURE:MAT)(OTCQX:MHREF) is pleased to announce that it has drilled 15 short drill holes south-east of the Kipawa deposit on its Zeus property. The 1,420 meters drilling took place from October 10 to 22, 2012. These surveys have all come across syenite, which is the host rock typically associated with the Kipawa deposit. The syenite is at least 100 meters thick. 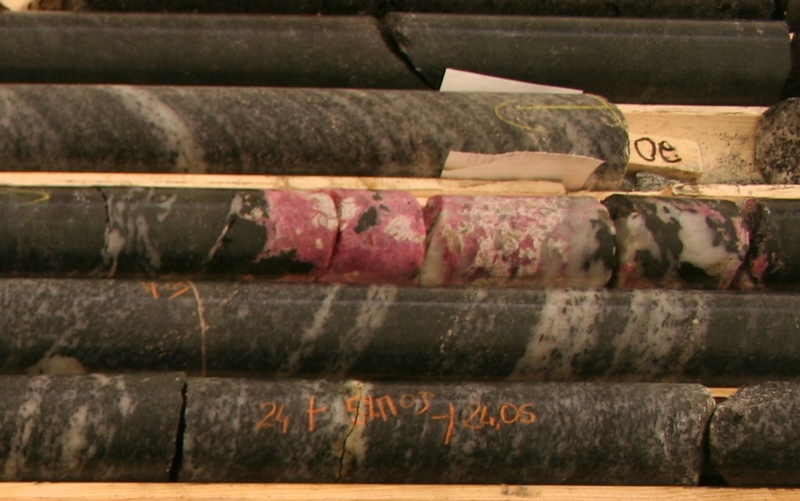 These surveys have also come across eudialyte, mosandritre and britholite, the rare earth-bearing minerals in the Kipawa deposit (see enclosed picture). The syenite has 2 to 3 intersections that display continuous mineralization. A more mineralized zone is becoming more defined. The thickness of this zone varies between 1 and 8 meters and is present from one drill hole to another. All samples are now at ALS-Chemex laboratory in Val d'Or and the results will be announced later. Given the similarities with the Kipawa deposit's minerals and close proximity to the contact of the gneiss, this zone can potentially yield extensions of the Kipawa deposit. Aline Leclerc, V-P Exploration (Geo.) is Matamec's Qualified Person for this press release. Andre Gauthier, President of Matamec, states that "the Company's objective was to discover new rare earth deposits on the Zeus property. This first drilling campaign is most encouraging considering the investment. The discovery of this zone by our exploration team is testament to years of fieldwork and brings us potentially closer to our objective." Matamec Explorations Inc. is a junior mining exploration company whose main focus is in developing the Kipawa HREE deposit with Toyotsu Rare Earth Canada, Inc. ("TRECan"). Following the positive conclusion of the PEA study filed on SEDAR in March 2012 and the hiring of a V-P Project development and Construction, Matamec and TRECan decided to move directly to the feasibility study. The March 2012 press release highlighted that the project has robust economics such as: $606 million before-tax value (NPV8%), a 36.9% before-tax IRR, $2.8 billion revenue, $1.67 billion EBITDA, a before-tax payback period of 2.4 years, etc. (see press release dated January 30, 2012). Figure 1 is available at the following link: http://media3.marketwire.com/docs/MAT_Figure1.jpg.